In order to understand geology, we need to think about the rocks below our feet in three dimensions. Those spatial relationships— what’s on top of what, how rocks are faulted or folded— give us all kinds of interesting information. While maps are useful in all kinds of ways, they’re a little lacking in the 3-D department. 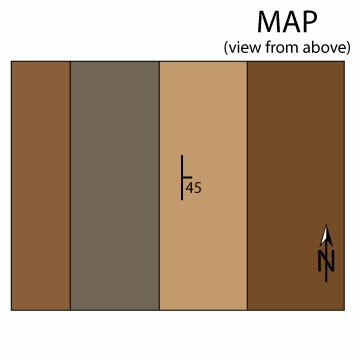 So when we’ve measured the orientation of a rock layer, we need a way to represent that on a map. Here’s a basic primer on how that’s done. The geological lingo for this is “strike and dip”. The words may be confusing at first, but it’s really quite simple. Let’s start with some nice, horizontal sedimentary rocks. Pretend the top of this block is the surface of the Earth. Picture a kangaroo hopping across it, if that helps or entertains you. 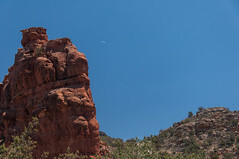 Let’s picture a single layer of that rock and tilt it downward to the right. The tilt of that layer is what we call “dip”. We describe this layer as dipping to the right, because that’s the direction it’s tilted downwards toward. We measure the dip as the angle between the layer and horizontal. Now, let’s try to imagine looking at that same tilted layer from directly above it. Again, it’s dipping downward to the right. Draw a horizontal line across that layer— that’s what we call the “strike”. (Don’t worry about why we use that word.) In this example, the strike is north-south. That means this layer is dipping to the east. Here’s a block made of tilted layers instead of horizontal ones. The top of the block is still the surface of the Earth, but I’ve sliced out a piece of the block to help us visualize this better. Imagine you’re looking at a cliff. When you look at the side of the block, you can see the dip. When you look at the top of the block (the surface), you can see the strike. Click the image below to explore a real outcrop of sandstone and siltstone from the Oregon coast that looks a lot like this. Be sure to zoom in and get a closer look. Here’s an annotated image of that outcrop, just to make sure you can see the strike and dip. You can click on this image to see more photos from this spot. If you click this link, you can check out the area with Google Earth. Geologists carefully measure the strike and dip on an outcrop like that using a tool called a Brunton compass, pictured below. 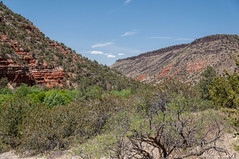 Once you’ve made the measurements, you can display them on a geologic map— which was our goal at the start of this post. Strike is easy enough, since it’s a compass direction. If we measured the rock striking north-south, we would draw a short, vertical line on the map in the location of our measurement (assuming up is north). If the rock was dipping 45 degrees to the east, we would add a tick mark at the midpoint of our strike line, pointing east. 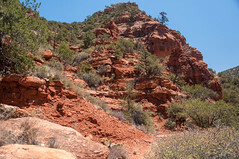 Think of the tick mark as an arrow pointing in the direction a ball would roll if you could set it on that rock layer. Just below that we would write the measured dip: “45”. It would look something like the example below. 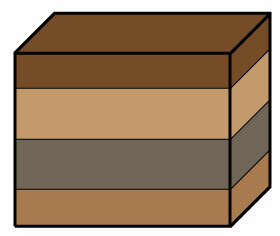 The different colors on the map represent the different rock layers exposed at the surface, just like looking at one of the block diagrams from above. Without the strike and dip symbol, we would have no idea if those layers were dipping to the west, to the east, or were vertical. 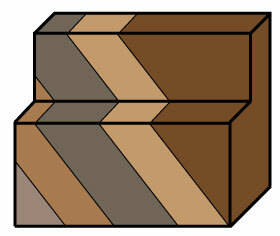 But by adding this simple symbol, we can understand something about the 3-D orientation of the rocks. Hat tip to Lockwood DeWitt for giving me the idea for this post. Thank you for posting this! It’s just what my students need! Thanks to Lockwood for suggesting it, too! Thank you helped me understand a document on assessment of landslide zone. Explanation made very easy. But what would an example of a south-north strike be? I get that the units for dip is degrees, but what useful information does the vertical strike line tell us? Think of it this way: we don’t just want to know how steeply the layer is dipping, we want to know what direction it’s dipping towards (east? west? southeast?). Otherwise we can’t describe it fully. Strike is always 90 degrees from dip. It’s just a slightly different way of describing the direction that layer is dipping. Does that make sense? The easiest way to visualize strike (for me) is to think of partly submerging that layer in water. The waterline (which is perfectly horizontal) will trace out the strike direction. Is there ever the case where the strike is not north-south? I still don’t fully understand the strike idea fully, especially with plunging folds. Absolutely- the strike can be any direction on the compass. I just wanted to keep it simple to describe in this example. Here’s an easy way to visualize strike: if you could partly submerge the rock layer in water, the trace of the water line would mark the strike. 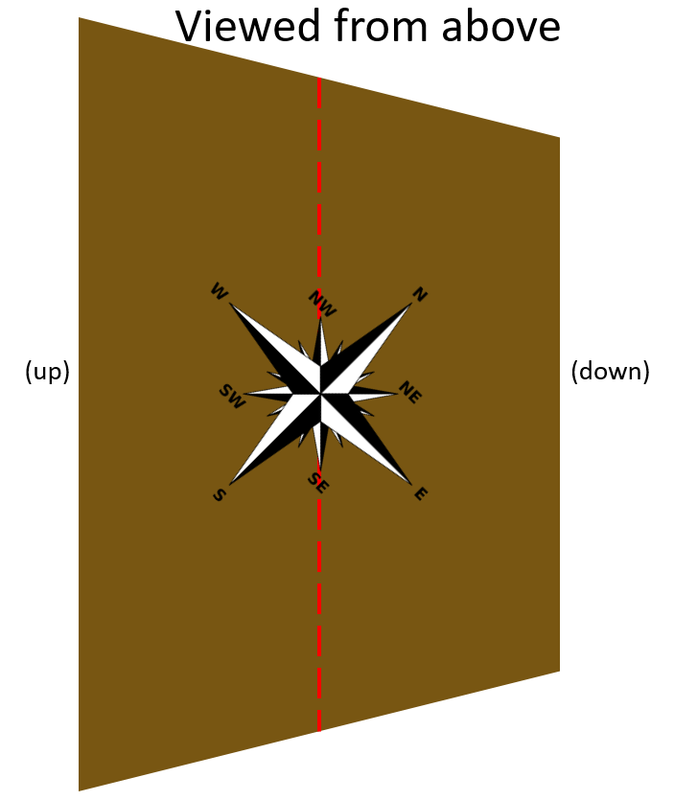 Viewed from above, that line points in some compass direction. But really, I think it’s often easier for people first learning the concept to start with the dip direction, and just recognize that strike makes a right angle with the dip direction. I like to describe the dip direction as the direction a ball would roll if you could set it on the layer and let go. A plunging fold obviously adds another layer of complexity, but does that help at all? Woaah. I am a little bit confused by the orientation of the strike. Is the reference the same as the dip inclining to the right? 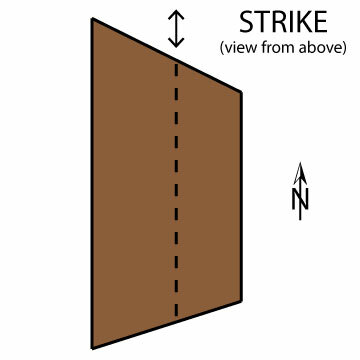 If yes, the drawing of the strike should be horizontal, not vertical. You’re talking about the third image, right? I drew that as if you were looking at the layer from above. The strike line would be, in reality, horizontal, of course, but if you were up in the air and still facing “north”, that’s how it would look to you. Hi. If someone tells me that the dip was to the north-east. Does that means that the slope (dip) is going from north-east to south-west (45 degrees)? If someone says a layer is dipping to the northeast, you can read that as dipping downward toward the northeast. So if you could drop a ball on that layer, it would roll directly to the northeast. You can’t assume what angle it’s dipping at unless given a number, though. So the strata (layer) started out as horizontal and then, dipped to the north-east. The downward slope would be from right to left, right? Left or right would depend on which direction you’re facing, so let’s stick with compass directions. Here’s another way to think of it: the northeastern side of the layer was pushed downward, while the southwestern side of the layer was pushed upward. Does that help? In another words, I’m looking at a horizontal strata (layer) in front of me and the end layer to my left goes upward while to my right, the layer goes downward? So, that is what it meant when someone is saying something titled to the north-east meaning that the strike line is facing north-east while the dip line is facing south-east? Am I close? In this situation, the left side will be up and the right side down only if you are facing northwest. The strike is really like the hinge-line for the tilting, and the strike here is northwest-southeast. The southwest side goes up, the northeast side goes down. Here’s a quick drawing like the third image in this post, with a compass rose aligned to what you’re describing. The dotted red line is strike. Really nice post, though i still have a doubt, in first illustration of the dip, you have shown a single layer making an angle of 45 degrees below the positive x axis (clockwise angle) or angle of 270 + 45 –> 315 (anticlockwise) with the positive x axis, is that an illustration of what you have explained later as “the rock was dipping 45 degrees to the east” in the final illustration? If I understand your question, yes! 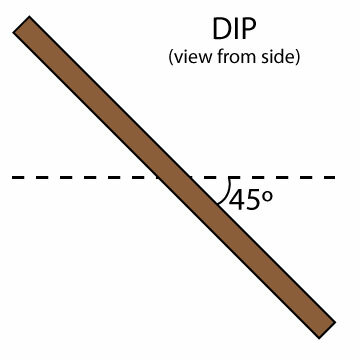 The first illustration shows a layer dipping 45 degrees—dip is described as the angle from horizontal. And I tried to draw all the figures to be the same (except for the first one, obviously), so that is meant to be dipping (downward) to the east. It may seem like you could just give the dip direction and skip the rest, but sometimes the strike is really what you want to talk about. Consider a “fold” for example—which is like a soft-cover textbook bent into a U-shape. One side of the “U” is dipping to the right while the other side is dipping toward the left, but both sides have the same strike! Thanks very much for d explanation..
Feel free to use the Contact link to send me an email, David. I’m not quite sure what you have there, as the notation is typically just [strike, dip], like “N50E, 50S”, which would mean “strike 50 degrees east of north, dipping 50 degrees toward the south”. But basically, that measurement would allow you to communicate to someone what the 3-D orientation of this rock layer is. Or did I misunderstand your question? Found this page by googling, but wikipedia was the first link and the wikipedia page on strike/dip is awful. It shows no examples. You might consider rewriting the page and put your graphics on there. Still not sure how to use that fancy compass. Thank you very much for the explanations. have got a question though…..How can I determine the strike and dip on a map? You can use math to figure it out if you have a sedimentary layer outcropping at a lower elevation on one side of a hill than on the other, for example, but generally you’re looking for the little strike-and-dip symbol on the map. The orientation of the symbol shows you the strike direction, and a little number will provide the dip amount–as in the last figure in this post.